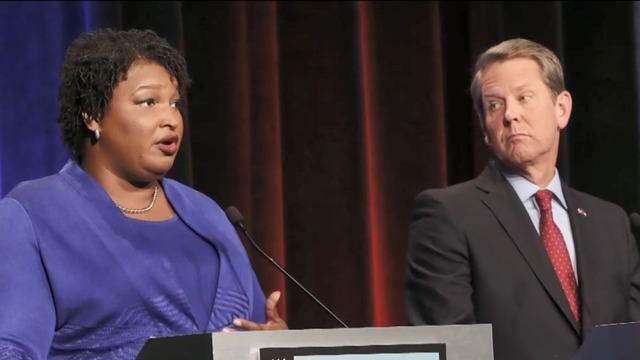 Republican Brian Kemp resigned his position as the secretary of state in Georgia as he declared himself the winner in his tight race for for governor against Democrat Stacey Abrams. At a press conference today in Atlanta, Kemp announced he is moving forward with his transition to his new job. Abrams has not conceded in the race, and her campaign said yesterday that all votes will not be certified until early next week. But Kemp said today that all votes other than provisional ballots have been counted. There are currently about 20,000 provisional ballots outstanding. "Even if she got 100 percent of those votes, we still win," Kemp said. "The votes are not there for her," Kemp said. "We won the race. It is very clear now, and we're moving forward with the transition." According to figures from The Associated Press as of 11:52 pm Wednesday, Kemp had 50.3 percent of the vote, while Abrams had 48.7 percent. But Abrams' campaign Lauren Groh-Wargo, at a press conference today, demanded that Kemp release "all the data and all the numbers" on ballots that have been cast, including absentee, military, and provisional, and explain how he feels confident in his victory. Some votes will not be certified until next week, she said. "The votes of all the voters of Georgia deserve to be counted before the former secretary of state announces his victory," she said. "Votes are still being counted." Abrams on Wednesday vowed to remain in the race, refusing to concede to Kemp. "Democracy only works when we work for it, when we fight for it, when we demand it, and apparently today when we stand in line for hours to meet it at the ballot box," Abrams said in remarks to supporters. "I am here today to tell you there are votes remaining to be counted. Voices are waiting to be heard." A lawsuit was filed Tuesday in a federal court in Atlanta accusing Kemp of using "the official powers of his office to interfere in the election to benefit himself and his political party and disadvantage his opponents." At his press conference, Kemp called the legal action "ridiculous." "The integrity of the process has been very clear in Georgia," he said.